I guess The Bookstore is hosting a Book Club? I can see where this could have been a fun event. But focusing on one specific book is a bad move from what I can see. If this book isn’t Harry Potter or some other gigantic cultural behemoth, focusing on one book for the entire country doesn’t look like it’s going to have a lot of interest. I know we’re supposed to pass out fliers to people buying “The Female Persuasion” but I can’t see this working out long term. The coupon attached to the flier and promises of free coffee sounds like they have to convince people to show up. Also, if you expect one of the booksellers to run the event for a book that they aren’t getting paid to read, how effective is it going to be? If there’s a questionnaire that the bookseller reads, those who do actually show up will see how fake it is from the top down. I know I’m supposed to be scheduled for the event, but I really can’t see myself finding the time to read a book I don’t care about unless I’m getting paid. I can barely find the time to read the books I own so I can’t see why I should add another title to the ever growing list of novels I have gathering dust. Book clubs are about friends getting together and reading books, then gossiping about whatever the heck they feel like. It’s an excuse to hang out with people you like more than anything else. 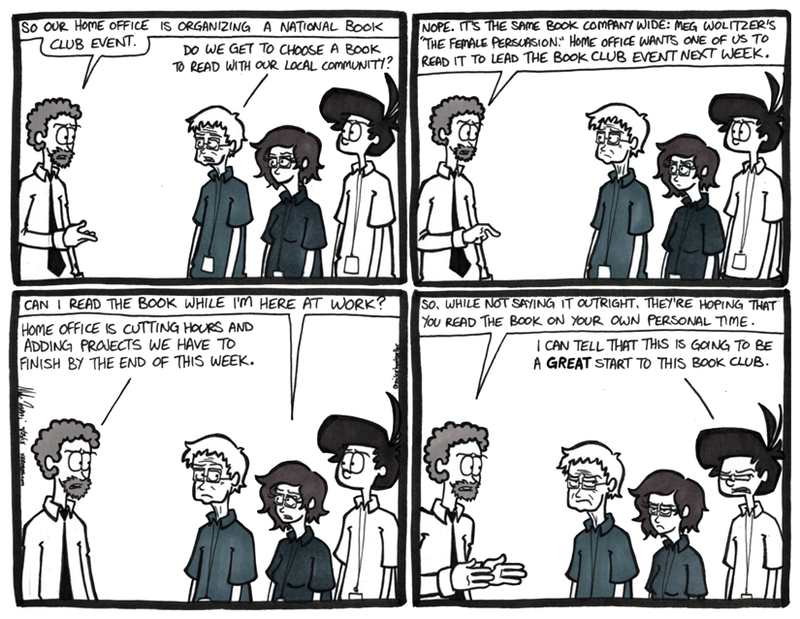 I know the intent of book clubs is to talk about the books they read, but that’s not how it goes for most of them. If you want a national get together for books, let’s not focus it on a title that is too new, and may or may not have publishers and distributors pushing its sales. The national/international Tabletop Day is a celebration of games you play… on tables. It’s never focused on just one. I’d say that’s a much better approach to take.